One Amazing Thing by Chitra Banerjee Divakaruni is a smattering of short stories within the context of a larger story. Basically an earth quake hits some town in California, so I think nine people are trapped in the Indian Consulate office. These people are all panicking and unhappy until Uma, a grad student who reads awesome books like The Canterbury Tales comes up with the idea to have all who are trapped share one amazing story from their lives. 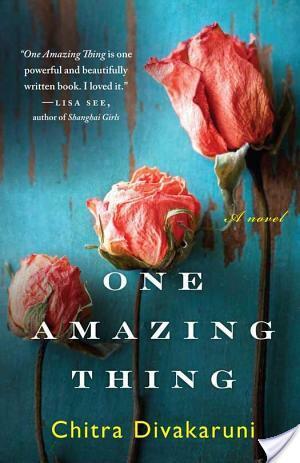 The premise of One Amazing Thing by Chitra Banerjee Divakaruni sounds rather simple, but I felt these short stories provided more insight and character development than some novels I’ve read. If you had to pick one amazing thing from your life to share with someone, I would think you would share something which is truly representative of the type of person you are. I mean, there is the type of thing you would consider amazing, I’m sure we all have different ideas of what is amazing. Would you chose something small? Or something big? I enjoyed the diverse cast of characters in One Amazing Thing by Chitra Banerjee Divakaruni. There was Cameron, the African-American who had a fabulous story about why he wanted to visit India. Mangalam, the boss of the consulate who has an interesting reason to be in America. Lily, the Chinese-American teenager and her grandmother – I think I loved Lily’s story the most. Tariq – a young man strong in his Islamic beliefs. Mr. and Mrs. Pritchett – the only white characters, Mr. Pritchett’s story literally made my eyes water. I know you probably expect each character’s story to have a common thread, but they don’t. Each story shared offers a glimpse into the life of a character which left me wanting more than just the single look. The writing style was gorgeous. For example, this quote “When I Was A Child,’ Jiang began, ‘I lived inside a secret.” Doesn’t that just leave you wanting more? Jiang’s story is again, sad, but lovely. It left me imagining Chinatown within India. Strange right? The pacing was fairly fast, because as said the short stories are interspersed within the reaction to the earthquake, so when a story would end, you would see how the characters are dealing with the quake. I was literally unable to put this book down, the stories were so compelling. I read One Amazing Thing by Chitra Banerjee Divakaruni in two sittings. While reading One Amazing Thing I suggest taking a break from it and if it emotionally effects you, instead of spending some cash money on wine, put that money towards Haiti relief, as this book does have an earthquake within it. Oh, this looks good. I added it to my tbr list. Enjoyed your review. I've heard a lot about this book but I want to read the first book by the author I have before I buy a bunch of others 🙂 I have her retelling of the Mahabharata and must read that soon! Oh I am SO jealous. I desperately want this book. Great review! Sounds like an amazing book. Wonderful review. You have an award! Come get! This sounds fantastic! I'm adding it to my list now. Thanks for sharing your review! This book sounds fantastic. Your review convinced me to give it a try for the POC Challenge.